Mazda MX5 Published: 16th Jul 2018 - 0 Comments - Be the first, contribute now! It’s 60 years since the Austin-Healey Frogeye Sprite burst onto the scene and it revolutionised the affordable sports car market. But just a quarter of a century later it seemed that cheap fun was off the menu with the MGB and Midget along with the Triumph Spitfire and TR7 out of production, and no replacements in sight. Fiat’s X1/9 was on its way out and while Toyota had introduced the MR2, it wasn’t a full convertible, simply a Targa roof. Was the affordable rear-wheel drive roadster consigned to history? Thankfully not, because in 1989 Mazda showed the MX-5, which would go on to become the world’s best-selling sports car and almost 30 years on it’s still going strong, largely because there’s so little competition. Rivals have come and gone but only the Mazda remains – and it’s likely to do so for many years to come. 1989 Mazda unveils the Mk1 MX-5,forst thought of back in 1983. 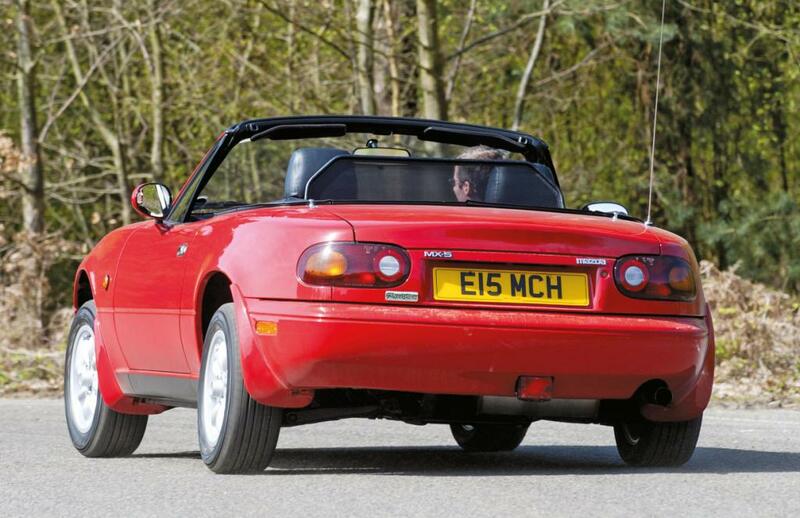 1990 The MX-5 goes on sale in 114bhp 1.6-litre form. There are just six exterior colours and two optional extras; metallic silver paint and a hard top. 1991 An officially approved Brodie Britain Racing (BBR) turbocharger conversion becomes available, pushing power up to 150bhp and torque to 154lb ft. ABS is also standard on the BBR, while the mammoth wave of limited editions also start being released. Also this year came the Racing Green and Le Mans specials. 1992 The Special Edition goes on sale complete with a classy tan interior and black paintwork. 1993 Yet annother Special Edition arrives, the SEII, with the same colour scheme as before but with knobs on. 1994 A 1.8-litre engine replaces the previous 1.6-litre unit, with 130bhp on tap. There’s a standard car or a higherspec 1.8iS edition. Side impact bars are also fitted from this point on. 1995 A 1.6-litre car is available again, but now with just 88bhp. There are also a couple of special editions released; the California and Gleneagles. 1996 There are more special editions this year, starting in the form of the Monaco and Merlot. 1997 This year’s limited editions are the Monza, Dakar and Harvard. 1998 A facelifted MX-5 goes on sale, dispensing with the pop-up headlamps of the original. The final Mk1 limited edition is the Berkeley. The new model has an all-new bodyshell, a glass rear window, revised cabin and more power. There are 1.8i and higher-spec 1.8i S versions available, the latter featuring electric windows and mirrors plus alloy wheels. 1999 The Special Edition makes a return, with a 1.8-litre engine, green paint and a tan leather interior. There’s also a 10th Anniversary edition with blue paint and roof. The UK gets 600 copies. 2000 This year’s specials include the Isola and California, both with a 1.6-litre engine. The Icon and Jasper Conran meanwhile have a 1.8-litre powerplant. 2001 A facelift brings standard ABS, electric windows, central locking and a more prominent front bumper. The 1.8i S is replaced by the 1.8 Sport. These cars are known as the Mk2.5. 2002 The limited editions return with a vengeance. This year there are the Phoenix and Arizona with either a 1.6-litre engine or a 1.8-litre unit. There are also the Montana and Trilogy with the bigger powerplant only. 2003 The Angels and Nevada are this year’s specials in 1.6 or 1.8-litre forms; the Indiana gets a 1.8 engine only. 2004 There are yet more specials; the Euphonic and Arctic. Both come in 1.6 or 1.8-litre forms. 2005 The MX-5 Mk3 is launched in August, but there’s still time for yet another special edition. This time it’s the Icon (again), and once again there’s a choice of 1.6 or 1.8-litre versions. The Mk3 is available with 1.8 or 2.0 engines. 2006 An MX-5 coupé-cabriolet becomes available for the first time ever. The plastic roof cuts weight; the car is mechanically identical to the regular convertible, aside from revised suspension settings. 2008 A facelifted MX-5 is unveiled, with a tweaked interior and nose, minor engine revisions together with an optional six-speed paddle-shift transmission. 2012 Another facelift largely amounts to optional sat-nav, a restyled nose and recalibrated brakes. 2014 The fourth-generation MX-5 is unveiled at the Paris motor show. When Autocar first drove the MX-5 early in 1989 it was already patently obvious that this was a classic in the making. “Mazda’s new MX-5 is what sports car driving is all about. It’s face-in-the-air fresh, in an immensely appealing two-seat roadster. The car is light, agile and quick, with a seat that supports, a wheel that commands, a gearchange that snaps, and an exhaust note of sheer exuberance”. Noting that the new arrival drew heavily on the Lotus Elan for its inspiration, the British car was 10 inches shorter – although the Mazda was hardly generously proportioned. With independent double wishbone suspension at each corner, fourwheel disc brakes plus rack-and-pinion steering the MX-5 served up the perfect recipe for a great driver’s car. But Mazda didn’t stop there; it honed the exhaust note, the gear change, the weight distribution and even the length of the pedal travel (2.6 inches if you’re wondering) to ensure a brilliant drive. When the same magazine put the MX-5 Mk2 through its paces in 1998 the verdict came: “Mazda has done it: replaced the irreplaceable. And with a car that is even better to drive than its forebear. That’s some achievement”, it said. The new car was heavier than before but the bodyshell was also much stiffer with every single aspect of the car revisited and redesigned. Most importantly though, the original basic formula wasn’t messed with; no wonder it continued to sell like hot cakes. When Top Gear’s Chris Harris revisted the Mk2 to pitch it against the all-new Mk3 in 2005, the older car was clearly well past its sell-by date. The seat was set too high and the steering wheel wasn’t adjustable. The bodyshell suffered from a lack of rigidity but the weighting and feel of the controls were still superb – just as they were in the new model, which had a bodyshell that was clearly far stiffer. Harris wrote: “The [new] car rolls less and engenders a feeling of surefootedness absent in the previous model”. But the new car’s suspension was too stiff and the kerbweight too high; 1122kg for a two-seater roadster with an all-alloy engine seemed unnecessarily heavy. It didn’t stop the Mk3 from getting the thumbs-up over the Mk2 though, for being objectively better in every meaningful way. Our view? Any MX-5 makes a great usable sports classic with ample reserves of performance and handling to satisfy the majority of owners who probably appreciate more the design’s smoothness and ease of driving that in no ways dilutes that sports car feel although the newer the car the more palatial they became if that’s what you want. Working full time for the MX-5 Owners’ Club means Iain MacPherson has a pretty good idea of what’s going on with the MX-5 market; these cars are far more than just a job to him. He comments: “There’s been a big decline in the number of earlier MX-5s left; in 2014 there were 23,000 Mk1s but that number has dwindled to 16,000 now. With values still low it’s likely that many more will bite the dust over the next few years. With demand as strong as ever but supply starting to become more restricted, it’s no surprise that some of the rarer models have started to go up in value. “If you can find a good one the Mk1 is still the MX-5 to buy as a collector’s piece, because it’s the earliest of the breed and it’s the purest take on the formula. While the rate of decline is pretty steady, owners are getting better at keeping on top of their cars as they know how to lengthen the lifespan,” Iain says. As it’s so affordable and relatively practical, there are plenty of people who use their MX-5s on an everyday basis. There are also a lot of modified examples out there – some have been done better (or more tastefully) than others. Good modifications don’t affect an MX-5’s value either way; stick-on cosmetic bits tend to be an acquired taste though. Iain MacPherson comments: “Buy something just to use for the summer and it’ll cost at least £1000 – and it might not be worth keeping for next season. Spend twice as much and you can pick up a Mk1 that’s worth keeping for the longer term; if you can stretch to £3000 or £4000 you’ll get something really quite nice. The ceiling for these cars is generally around £5000; exceptional cars can fetch more but by definition those come up only very rarely. Buying at auction is hit and miss as it can throw up some bargains – or you can pay well over the odds”. All of these values are for the Mk1, although Mk2 values are the same at the bottom end. MacPherson continues: “The Mk2 is harder to recommend as they’re even more rust-prone than the Mk1, so good ones are even harder to pin down. If you’re intent on buying a Mk2 buy on condition alone and spend plenty of time looking for something decent. There’s no difference in values between the Mk2 and Mk2.5 and if you can find a nice low-mileage car you can pay up to £4000 for it; the ceiling for superb Mk2s is £6000 but for this much you might as well buy a Mk3 instead as it’s a better car. “Early Mk3s have kept their value with prices starting at £5000-£6000. The most valuable cars are mint 25th Anniversary editions which can still fetch £15,000. It was this generation that introduced us to the MX-5 coupé-cabriolet; four out of five buyers opted for a hard top rather than a soft top. As a result there are lots of coupé-cabriolets to choose from with more than 47,000 Mk3 MX-5s still registered on UK roads. “If you’re not sure which generation to go for, choose between a Mk1 and Mk3 – only opt for a Mk2 if you know of a genuinely superb car at the right price, and still invest in a professional inspection as big bills may well be looming even if it’s not obvious. The Mk1 isn’t that comfy to drive; it’s fine for occasional use but not so well suited to long-distance touring. The Mk3 however, excels at long-distance drives and once the Mk3.5 arrived in 2008 it was even better as it was more sporty. Mazda refined the Mk3.5 again towards the end of its life with optimum wheel, suspension and interior specifications. The one to go for is the 25th Anniversary model but whatever you buy, try to acquire an MX-5 that’s been a one-owner example that’s been a second car all its life; there are plenty of these”. UK cars are more attractive to collectors but Japanese imports are a better bet, both Mk1 and Mk2, as it’s easier to find a really good example. That’s as long as it’s a recent import; if it’s been in the UK for years it could still be very rusty. Whatever you buy make sure it’s got a decent service history, especially with the later cars. Regular rustproofing is essential for any MX-5, but in terms of modifications it’s really down to personal choice as there are no weak spots as such. The suspension and brakes are superb and if you mess with these you could end up making things worse rather than better. The Mk1 has adjustable timing which can be set to 14 degrees instead of 10. This allows the engine to become more free-revving so it feels slightly quicker. Also, while the Mk1 1.6-litre engine revs nicely, the 1.8 can feel as though it’s struggling to breathe. By changing the exhaust manifold, downpipe, middle and rear box the exhaust gases can exit more quickly. To get the best results, remove the standard induction system and fit an aftermarket kit which will improve the Mk1 1.8, but less so the 1.6. If you want big power gains, the way to go is to fit a supercharger. Turbocharging is also possible but it’s the former that’s more common – although you’ll need deep pockets to do it properly. There’s no shortage of conventional turning gear either while 250bhp Jag V6 engines can be fitted, as specialist rocketeerltd.com has done, without hurting the weight distribution! Upgrading the suspension? Then Gaz Gold Pro coil-overs are your best bet as once set up the ride is completely transformed, inspiring much more confidence in the handling of the car. Another one that’s highly thought of is the MeisterR set-up; it’s not for the purist but it’s a brilliant conversion. You can also beef up a Mk3’s anti-roll bars with RX-8 items (it uses the same platform) while Eibach offers a kit that lowers this generation of MX-5 by 30mm; it’s best suited to soft-top cars. However, as Mk1s become increasing thin on the ground originality will become more important and it has to be said that many are out of sorts and a good service and particularly a full geometry readjustment plus good tyres will reap the most gains. If you needed proof of the MX-5’s popularity – or that it’s a bona fide classic – just look at the MX-5 Owners’ Club which just goes from strength to strength. Membership has soared past the 7000 mark, with enthusiasts joining for an array of reasons. The club’s Iain MacPherson comments: “We’ve got almost 40 regional groups which are very active – we’re also a very active club nationally. Many of our members are long-term owners who have run several MX-5s over the years; they join because they want to boost their social life, take advantage of the insurance scheme or take part in track days. They might also want to exchange information or ideas on our busy forums, which contain a vast amount of knowledge. “At our biggest events we attract over 2500 cars and more than 5000 people, so the networking opportunities are immense; the club has links with every major supplier or company within the MX-5 support network. Next year the club celebrates 25 years while the MX-5 will be 30, so expect some really big celebrations”. Although interiors are generally durable, check the driver’s seat, which wears down the side as you get in and out. Aftermarket seats and decent standard used items aren’t hard to find, but still a useful bargaining point. Hoods last reasonably well but can suffer if the car has been cleaned badly (especially in a car wash) or not at all – but what really kills the factory roof is long-term exposure to the sun. See what state the rear screen’s zip is in; they often get broken by ham-fisted owners. Replacement hoods aren’t that expensive at £160 for a vinyl one; you can even get a mohair replacement complete with a glass rear screen for just £349. The electrics are generally reliable. If you’re looking at a Eunos ask if it has air conditioning; if it has, make sure it’s working properly. Also check that the electric windows work properly, as the motors can burn out; lubricating the mechanism can make all the difference. They’re easy to replace; expect to pay £40 per side for replacement units. All Mk1 parts are readily available new or used so no real problems here or unlikely to become one. The MX-5’s engine will rack up 200,000+ miles if looked after but because the cylinder head is alloy, the anti-freeze level should have been maintained to prevent internal corrosion. The cam belt should also have been renewed within the last five years or 60,000 miles; factor in a new belt if at all uncertain, although if the belt does break, the pistons and valves won’t collide, so all is not lost. The earliest engines are also the ones most likely to give problems. The water pump wears, so lift the bonnet and with the engine idling, listen for knocking. A new pump is £40; if it needs replacing renew the cam belt at the same time. A specialist will typically charge £120 to replace the pump, with a new belt usually £200. An oil weep is normal, but there shouldn’t be lubricant all over the engine bay. The culprit is the cam sensor’s O-ring, at the rear of the engine. Any car with a BBR turbo conversion tends to get through exhausts more quickly than a standard car, because of the increased exhaust temperatures; again, the fitment of a stainless steel system is the ideal solution. Even if a replacement engine is needed it’s no problem as there are lots of used units to buy because so many cars are still being broken. The Mk3 is fitted with a timing chain which lasts 200,000 miles or more. The Mk3 engine is very reliable so just check that it has had regular oil changes and that the oil is up to the mark. Most failures are down to lack of oil as these engines burn lubricant. Earlier cars tend to survive better than later ones; according to Chris, the least rusty MX-5s tend to be Eunos editions on a G- or H-plate. Major (or at least significant) corrosion tends to be a common problem. The key areas to check include the sills, wheelarches, sill end plates, front and rear jacking points, floor rails and the chassis rails too (the latter especially on the Mk2), with repair costs typically more than the car’s value. Also look for low-quality patching; putting this right can be more costly than just doing the job correctly in the first place. On the Mk1 and Mk2, mud flaps can retain debris and mud which leads to rotten wheelarches. Early cars can suffer from corroded door jambs, because the kick plates originally fitted allow water to collect underneath. Mazda sorted most claims under warranty, but it’s worth removing the trim to check, as it’s held in place by just two screws. The boot is shallow, and some owners overfill it then slam the bootlid down, damaging it in the process. The bulge that results is obvious and not easy to remove. The factory fit Panasonic gel batteries to the Mk1 and Mk2; they’re often replaced with lead-acid items. Fitted in the boot, the lead acid fumes have nowhere to go and this corrodes the inside of the boot. Correct batteries are available for £100. Part of the MX-5’s charm is its ultra-sweet and beautifully direct gearchange. However, over time it can get sticky if the linkages aren’t lubricated, so go up and down through the box on a test drive and make sure all’s well – pay particular attention to the change between second and third gears..
All UK-supplied cars were fitted with a five-speed manual, but those built for the Japanese market (badged Eunos) were offered with a four-speed auto. For a rear-wheel drive sports car, the MX-5’s suspension components are surprisingly durable. Shock absorbers and springs should easily last 100,000 miles, although many owners will have fitted aftermarket recalibrated parts well before that mileage has been racked up. Bushes aren’t so long-lived, but they should still last at least 60,000 miles. Any car that’s needed fresh bushes well before this has probably been thrashed to within an inch of its life at every opportunity – so ask the seller how many sets of bushes the car has had. Because there isn’t much power and the kerb weight is low, MX-5s don’t tend to get through tyres very quickly, although the Mk3 goes through tyres quicker as it’s heavier. These cars are very sensitive to tyre pressure changes and incorrect wheel alignment; setting things up properly often transforms the dynamics. Most (but not all) of these early MX-5s were fitted with alloy wheels; many of those that were initially supplied with steel wheels have had alloy replacements by now. Whatever is fitted, check the state of the finish – especially if the original Mazda items are fitted. Over time these tend to suffer from pitting after the wheels have got caked in brake dust then just left. It’s just cosmetic; reviving tired alloys is a straightforward job at around £35 per wheel. Brakes bind through corrosion on cars used only sparingly, especially where the Mk3 is concerned, so check for seized callipers. In period there were some who felt the Z3 wasn’t as dynamically accomplished as a BMW should be, but unless you drive the car on its door handles you’re not likely to notice any shortcomings. Choose from efficient four-cylinder engines and glorious straightsixes, including the rare and ultra-quick M Roadster. All are well screwed together but the four-pot cars are the most reliable of the lot. It’s amazing how much MG you can buy for under £1,000, but while these cars are great fun, you have to tread carefully. Corrosion tends not to be too much of an issue, but tired Hydragas suspension on the F along with failed head gaskets on the F and TF are both a common spectre. Best buy is a non-VVC manual car, as the CVT is nasty and the VVC engine goes out of tune too easily. With three generations to choose between – all eminently affordable – you’re spoiled for choice. All are mid-engined but it’s only the third-generation car which is a true convertible – and it’s also the most compromised of the lot in terms of practicality as there’s no boot space at all. But if you want a sports car that’ll just keep working and which is a blast to drive, then look no further. It might not be much good at carrying wardrobes or carrying more than two people, but if you’re looking for a car that’s delicious to drive, plenty practical enough for European touring and dirt cheap to buy, the MX-5 will tick every box going. Don’t be afraid to buy something imported from Japan, especially if you want something a bit special, but do your homework to pin down exactly what you’re buying, because there are so many variations on the theme that it can be hard to keep up. If you can find a mint Mk1 for the right money snap it up as those are already starting to become collectible, while the Mk3 is the most usable. That leaves the Mk2 as the budget buy – not so easy to recommend but still a heap of fun if you can find a good one – which can be easier said than done.